Find a world beyond earth which is real, vivid and eternal. Many people have claimed to have visited heaven and yet these accounts often conflict with what the Word of God says. 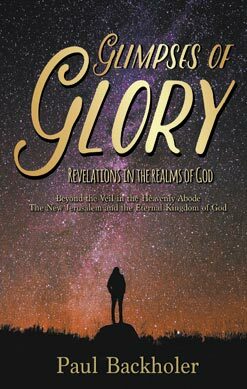 In this narrative receive biblical glimpses and revelations into life in paradise, which is filled with references to Scripture to confirm its veracity. Join a believer, an angel and a glorified man on the most biblical book about heaven that you may ever read. Find answers to questions and open your mind to eternal thinking, as you reach beyond the veil into eternity, with those who love the Lord Jesus Christ. Paul Backholer is a British broadcaster and the founder of ByFaith Media. He is the director of ByFaith Television which airs on multiple platforms around the world and is the producer of several Christian documentaries. Paul is the author of many books, including The Baptism of Fire, How Christianity Made the Modern World, The Exodus Evidence and The Ark of the Covenant. Paul studied in a British Bible college and has travelled to over forty nations working on Christian projects.